First let me start by saying congratulations on reaching the final stages of your undergraduate career. Well done! My name is Gladys Ruiz and I was in Zapoura’s online capstone class last winter. 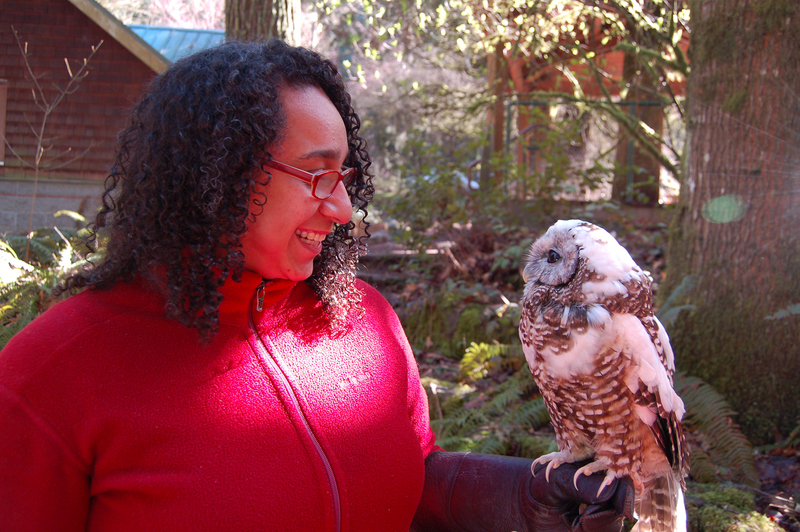 I currently work for the Audubon Society of Portland as their Conservation Education Coordinator. I also run Audubon’s youth training and employment program called TALON. Since 2010, I’ve been part of this amazing conservation organization. Trained and working as an Environmental Education, my passion has been getting kids out into nature; specifically those that have often are left out of traditional environmental education. When I signed up for this capstone I had several things in mind. One, the flexibility of participating in a capstone online helped alleviate the stress of taking 14 credits and working full-time, two, it provided me with a solid background on the issues surrounding education in our country, and three, it gave me an excuse to connect with my local community. I was able to connect my passion for environmental education and directly activate a working plan to bring this into the lives of residents living at a Northwest Housing Alternatives housing site. Since my placement at this site, I have held 3 nature walks with the Northwest Housing Alternatives housing site Springwater Commons. I have been able to connect this community to services that otherwise were not available. Currently serving on a few community volunteer boards and advisory committees, notably the City of Portland Parks Board and the Center for Diversity and the Environments – Environmental Professionals of Color (EPOC) Portland, I have since recognized the validity of my voice and my own experiences. While these experiences are often attached with a steep learning curve, for me it’s being able to find my voice among the many voices that have experience beyond my years. I have been able to see my path doing community work not as a chore but as a rite and a privilege. And with this privilege comes so much more work than I ever imagined, this being both ups and downs. Sleep sometimes is often interrupted by “To Do List” and the “I feel like I forgot to do something”. For me, that is often a sign of juggling too much. When I began to do community work, I often did it to just get out. But as I have continued on this my career path, I have noticed that building community has been what really motivates me. For me, it’s been about being connected to something greater than myself and helping to connect others. I want to help the change and be the change.